NEW & IMPROVED RUNNING BELT INNOVATION. SEE AND USE YOUR PHONE AT ALL TIMES: With The New Design Running Belt You Can Now See The Run Stats, Change Music Or Answer A Call Without Stopping. THE COVER IS TOUCH SCREEN COMPATIBLE. 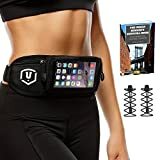 This Running Belt Waist Pack Fits Perfectly All SmartPhones From iPhone 6 6 PLUS Samsung Galaxy Note 4 S6 S5 Moto X Nexus 5 – Even With The Case On And Headphone Jack. FITS YOUR WAIST SIZE PERFECTLY & NEVER RUNS DOWN OR UP: The running belt Is Adjustable And Can Fit Extra Small Waist Sizes 27″ Up To 47″ And We Made It Out Of High-Quality Elastic Expandable Strap For Perfect Fit. Every Single Time. NEVER DAMAGE OR LOSE YOUR BELONGINGS. The Running Belt Is Made Out Of SWEAT PROOF Foam Padding So Your Belongings Stay Dry At All Times. The Running Belt Is Also BOUNCE FREE. You Have Three Separate Pockets For Your Money ID Wallet and Credit Cards. Better Then The Armband Enjoy Your Run Without Fear Of Damaging Or Losing Anything. 1 YEAR MONEY BACK GUARANTEE: If You Don’t Like It The Running Belt, You’ll Receive A Full Refund With Our 100% MONEY BACK Or If Something Ever Happens With Your Running Belt WE WILL CHANGE IT Immediately Without Any Costs From Your Side. Amazing News: We Donate 5% Of Profits To LIFE WITHOUT LIMBS Charity! Together We Can Make A Real Impact On People’s Lives! Are You Looking For The Perfect Running Belt? The One That Has Spacious Pockets, Never Runs Up Or Down While You Run, Made Out Of Sweat-Proof Materials And That Fits Most Big SmartPhones? 1. HOLDS EVERYTHING YOU NEED. Spacious pockets that hold everything you need. Easy phone access, even with headphones plugged in or with case. 2. FITS YOU PERFECTLY. The Running Belt Is Expandable From 27″ To 47″. 3. YOU CAN SEE AND USE YOUR PHONE. With The Touch Screen Compatible Cover. 4. SWEAT-PROOF MATERIALS. Never Risk Damaging Your Smartphone While You Sweat. The Running Belt Is Perfect For Men And Women. 5. SPECIAL KEY COMPARTMENT AND KEY RING. Never Scratch Your Phone With Your Keys. Spacious Front Pocket For Money, Credit Cards and More. 6. SILICONE AND ROPE ZIPPERS. Enjoy Your Run Without The Annoying Sound Of Metal Zippers Bouncing While You Run. RISK FREE 1 YEAR 100% MONEY BACK GUARANTEE! Note: For the smaller phones than iPhone 6+ it will fit, but it doesn’t take up the whole touch-screen pocket space. And it will NOT fit iPhone 6/6+ with Otter Defender/Comuter case. Click the “Add to Cart” Button now, and get the Two Special Bonus Gifts: Elastic Laces and Runner’s Survival Guide EBOOK (TOTAL VALUE £15.99) for a more enjoyable running experience.